On a beautiful Friday evening in May, Elizabeth and Tom held their wine country wedding at the elegant and stunning Jacuzzi Family Vineyards. Lily Rose Photography captured all of the moments from the day. With their creative eye and attention to detail every photo they take comes out perfect. Quintana Events coordinated Elizabeth and Tom’s wedding. Alex and his team always go above and beyond, creating an organized, fun, seamless and stressfree wedding day for the bride and groom. 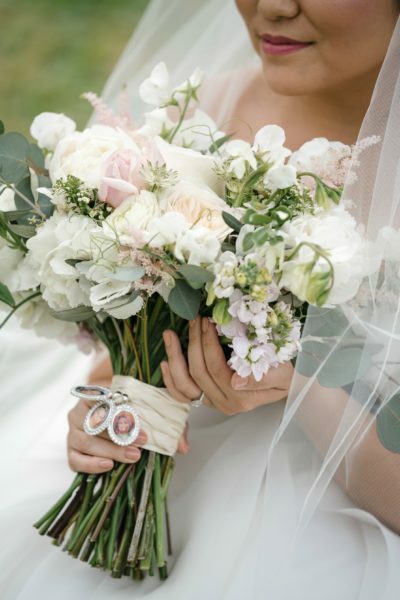 Park Avenue Catering created and delivered the incredible, mouth-watering menu for the day, and Vanda Floral Design designed and made the romantic bouquets and floral pieces for this wine country wedding. For pre-ceremony music, Elizabeth and Tom chose lovely pieces such as “Spring” by Antonio Vilvaldi, “Prelude in C” by Bach and the instrumental version of Ed Sheeran’s “Perfect”. With guests seated in the courtyard, Elizabeth processed in to the instrumental Ukulele version of “Somewhere Over the Rainbow”. And the new Mr. and Mrs. recessed out to the instrumental version of the Beatles, “All You Need Is Love”. 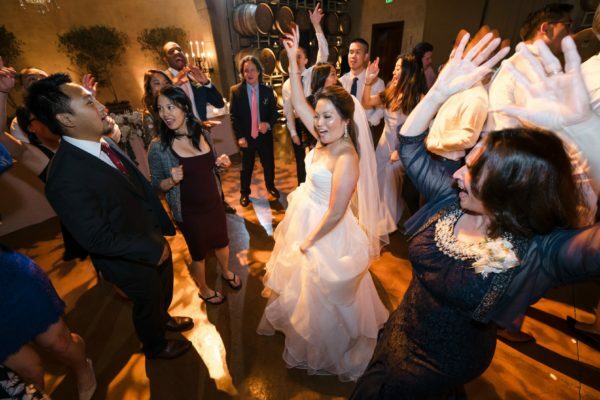 Elizabeth and Tom entered the Barrel Room with “You Make My Dreams Come True” by Hall and Oats and then onto their first dance, “Tenerife Sea” by Ed Sheeran. Elizabeth danced with her dad to “The Girl You Think I Am” by Carrie Underwood. And Tom danced with his mom to “How Sweet It Is To Be Loved By You” by James Taylor. Opening the dance floor with “Uptown Funk”, AMS DJ Alex threw one heck of a dance party! Stopping briefly for the bouquet and garter toss, the dancing didn’t stop until the very end. Closing out a night of fun and high energy, “Shut Up and Dance” by Walk the Moon was the last song of the night. Congrats Elizabeth and Tom!! 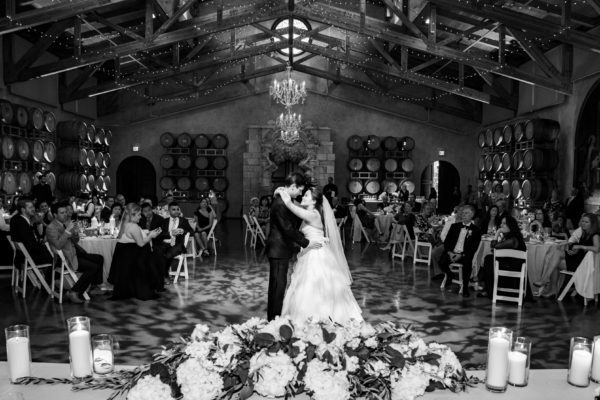 Thank you for letting us be part of your lovely wine country wedding! Joe was the best DJ we could have imagined for our wedding! The ceremony music blended perfectly (and we didn’t even rehearse with it). He kept the guests groovin on the dance floor all night long. All our guests made comments about how great he was. Highly recommend AMS entertainment. Quick to respond, always there if you have questions, and the added lawn game option was perfect for our ranch wedding. Thank you Joe for making our day that much more special! !